Look out the window and survey the wondrous scene before you! There's animals, there's plants and, wouldn't you just know it, there's an atmosphere out there! And how does it all work? Well, uh, I'm not entirely sure, although I can differentiate between a raven and crow - it's all in the greasiness of their feathers. Anyway, yes, this marvelous world around us is a bit of an enigmatic mystery even for us grown ups, but what about the younger, less experienced folk who are standing on tiptoes and craning their neck to look out the window? Naturally, it's going to a struggle for them to get their tiny heads round it all, but thankfully, for them, there's a great clarion call to learning coming courtesy of Bellamy's Bugle. From the comfort of his beloved County Durham home, David Bellamy is on a mission to explain all the wonders of the natural world around us. With a wealth of knowledge at his inquisitive fingertips and a whole host of expert contacts in various fields of interest, Bellamy aims to uncover the facts lurking beneath nature's underbelly. 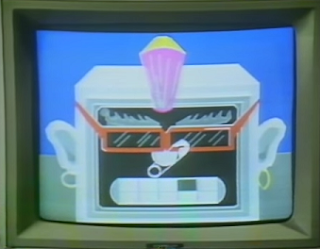 And, quite often, he'll be joined by a selection of schoolchildren and viewers who have written in to request that their curiosity is quenched. Helping Bellamy to introduce and conclude the show with a little helping of friendly banter is Smart Alice (Kate Lee), a supercomputer with plenty of sass. Together, our curious hosts will explore subjects such as Halley's comet, slugs, gannets, electricity, sewers and even the road to Jericho. 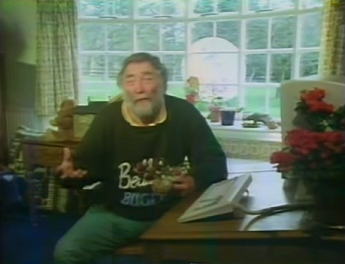 Bellamy's Bugle was David Bellamy's first children's TV show of his own and aired between 1986 - 1988 on ITV over the course of five series. 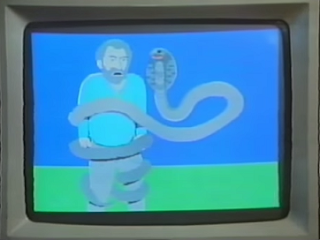 In total, 84 episodes were produced by Yorkshire Television and each episode ran to 10 minutes. Directing the series was David Wright and, both inspired by the novel Swallows and Amazons, it was decided that Bellamy would take his inspiration from the character of the kindly Uncle Jim from the aforementioned novel. Although, truth be told, his 'character' doesn't seem a million miles away from Bellamy's real life avuncular personality! "I was an actress and voice-over in the Manchester/Leeds scene in those days, so was often asked to do narrations for Yorkshire TV. 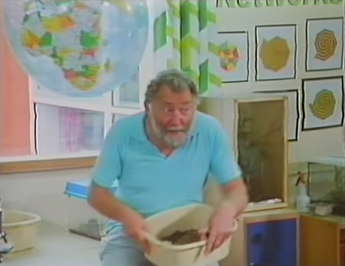 I’d also started a children’s TV series produced there (Puddle Lane with Neil Innes). Part of that programme required me to narrate a story. It’s the old story of the more you work the more you get noticed… I was recommended by the producer of Puddle Lane I think." "The director wanted a fresh personality rather than an ‘intellectual or boring know-all’ approach. 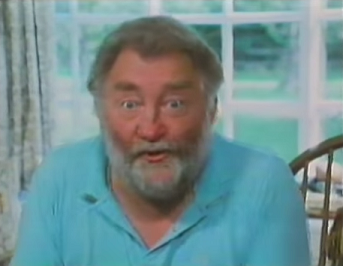 The scripts were fun and we soon developed a quirky, friendly relationship (David Bellamy and Alice). And don’t forget – it was quite rare to have the all-knowing character to be a girl in those days! The whole team were keen to promote my character too – I have a photo and write up of me as Smart Alice on the TV page in The Times newspaper. Very posh!" 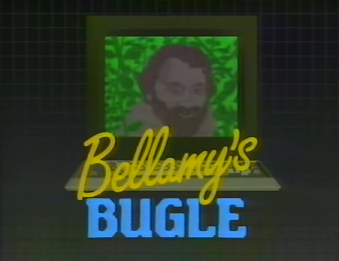 I can't specifically remember watching Bellamy's Bugle during the 1980s, but it always seemed as though David Bellamy was on my TV set during that period so it's likely I caught Bellamy's Bugle. Any particular memories, though, are limited to the wonder of Bellamy's beard, but, thankfully, a number of episodes have found their way on to YouTube. "It’s a bit clinical. I sat in a studio on my own. A large screen on the wall in front of me showed the film. The soundtrack of David would be played in when we were in conversation but I only spoke my lines when the red light came on. The director, producer and engineer were in the control room – I couldn’t see them so all communication was talk-back. I do remember the main problem I had. The studio was above the canteen and at bang on 11.30 the smell of chips would waft up to the studio and my tummy would rumble like an avalanche! This is a nightmare for a sound engineer so we had to stop and feed me biscuits to help it calm down." Just as Kate's appetite was sated with the welcoming taste of biscuits, Bellamy gleefully quenches his viewers' thirst for knowledge with his wit and passion in Bellamy's Bugle. The dedication for the subjects belies the fact that this is a very personal project and his ability to engage with younger viewers is almost otherworldly. In fact, he genuinely appears to have cartoon DNA running through his veins as he leaps about with all the animation and gesticulation of a Looney Tunes character. "From my memory of that brief meeting – he was a hoot. Yes, very enthusiastic. Fun. Exactly as you’d imagine. He’d thought it was time he should meet his Alice! I’d always (long before our programme) been a huge fan of Bellamy. I suppose his equivalent now in popularity is Prof Brian Cox. Very different personality, of course, but that ability to engage young people (and old people!) into science and nature – on a high level but populist as well – that’s rare and special. I remember hearing David on the radio years later in the 1990s talking about how worrying (and sad) it was that bright young people were no longer interested in going into science / engineering / naturalist vocations – that they were more interested going into the city to make money. That’s why people like Prof Cox are important – they have such an influence over young people to make career decisions, which benefit us all." And, this sums up why Bellamy's Bugle is such a success. Rather than taking a stuffy, studious approach to education which would have viewers switching over to BBC, Bellamy takes an alternate approach packed full of infectious and exciting charm. Combined with the relatively brief episode lengths, it's difficult not to become fully engrossed, I even found myself bathing in the wonderful knowledge that there are thousands of different types of daffodils! At that time (late 1980s) there were massive reorganisations in all TV companies. They were changing form being ‘creative’ led to accountancy led. So many innovative programmes were scrutinised – and axed. To give you an idea – pre then if you visited Yorkshire TV in Leeds you would see actors in costumes everywhere, arty types / writers / programme makers hanging round the canteen, reception/bar/corridors. It was like one big creative home. On my later visits by 1990 this had all disappeared. The place was like a massive office block with no atmosphere. This happened to all the TV companies, not just Yorkshire. End of an era. It hasn’t recovered, probably worse. TV is dominated by ‘Execs’ and accountants, rather than the creatives, writers and programme makers. For our final programme the team had had a jumper knitted for me with ‘I WAS SMART ALICE’ on the front. I still have it as a fond memory." Thankfully, Bellamy's Bugle acts as a fine legacy to this more creative era and, hopefully, more episodes will pop up online in the future as it's more than worth a watch.